The parish of Kilmallie operated its own locally administered parish poorhouse or almshouse. 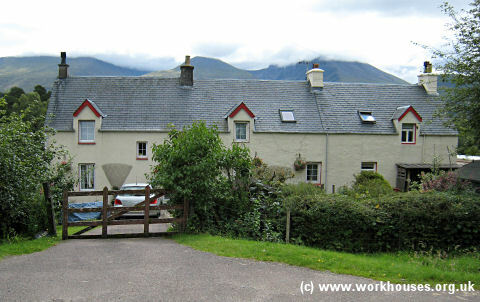 The building was situtated to the north of Fort William, on the southern bank of the River Lochy. It was identified as a poorhouse on the first edition Ordnance Survey map of 1871, but not on the second edition of 1900. Fort William poorhouse site, 1871. From around 1887, Kilmallie rented a former school building at Muirshearlich for use as a poorhouse. In 1904, the premises could accommodate 8 up to 8 men and 8 women. Kilmallie former poorhouse at Muirshearlich, 2010. The Lorn Combination was created in 1862 and initially comprised 10 parishes: Ardchattan and Muckairn, Glenorchy and Innishail, Kilbrandon, Kilchrennan and Dalavich, Kilmore and Kilbride, Kilninver and Kilmelfort, Lismore and Appin (all Argyllshire) together with Glenelg, Kilmallie, and Kilmonivaig (all Inverness-shire). They were later joined by Ardgour (Argyllshire). The total population of the member parishes in 1881 was 22,047. Lorn Combination Poorhouse was erected in 1862-3 on a three-acre site on Miller Road at the south of Oban. The architect was John McKillop. It was a plain two-storey L-shaped building, extended in 1896 to designs by Kenneth Macrae, and again in 1912 with James G Falconer as architect. Its location and layout are shown on the 1899 map below. After 1930, the poorhouse became the West Highland Rest Poor Law Institution. In 1946, it had 179 beds including 26 hosptal beds. 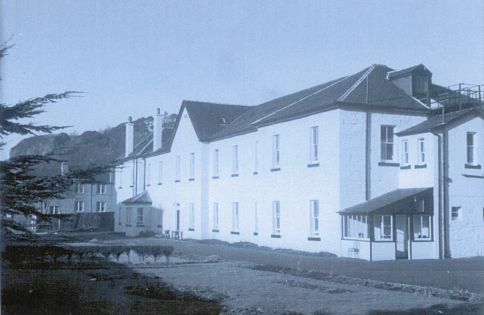 Under the National Health Service it became Dalintart Hospital. The buildings have been demolished. Lorn former poorhouse from the south, c.1970. © Arygll and Bute Council. Argyll and Bute Council Archives, Manse Brae, Lochgilphead PA31 8QU, Scotland. Holdings include: Minute books (1898-1930); Admission and discharge register (1909-37); Visiting Committee report book (1920-48); Chaplain's Register, including notes on baptisms in poorhouse (1903-41); etc. Thanks to Argyll and Bute Archives for information and photo.